I really enjoy the Stickmen books. 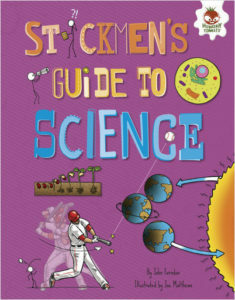 This time the stick guides explain science. I appreciated that there was a simple history on scientists as well as science. I like that Farndon uses examples that appeal to children, such as food, sports, and cars, to show how science is in the world around us. Matthews illustrations showing the stickmen using science (melting ice with a hair dryer) add some humor to the topic. There is a lot of reading and technical terms in this book, a bit more than other’s in the stickmen series, which might deter some students. But overall, this is a fun way to bring science to life.